Kevin Allison, comedian, host, and creator of incredibly successful “RISK!”, stopped by the KFOG studios to chat with me before his upcoming “RISK!” live show in San Francisco this week. 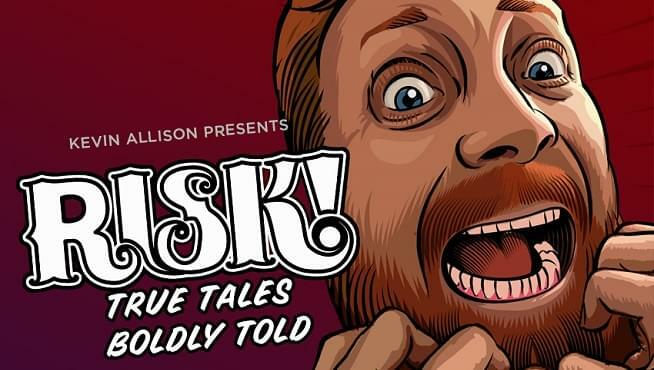 “RISK!” is a weekly podcast where professional comedians and amateurs alike come to share some of the most revealing personal stories they could ever imagine in front of live audience. Stories run the gamut from the hilarious to the filthy, to extremely emotional and heartwarming. The essential components are honesty and vulnerability. “RISK!” constantly ranks as one of the top 10 most downloaded podcasts on the internet, with over a million downloads each week. Kevin and I talked about how his time on the legendary sketch show The State on MTV lead him to develop the idea for the “RISK!” podcast, thanks to a suggestion from fellow castmate Michael Ian Black. Kevin also shares a couple of his favorite stories from Risk! over the years, and clues me in to the secrets of being a good storyteller. Make sure to check out the RISK! Live show Friday, July 27th at the Swedish American Music Hall in San Francisco and stop by Book Passages in San Francisco tonight for a special signing of Kevins’ new book RISK!, a collection of 37 of the best stories told on the show over the years.